JDC - Archives : Jewish refugee children in English class in the Hallein DP Camp. 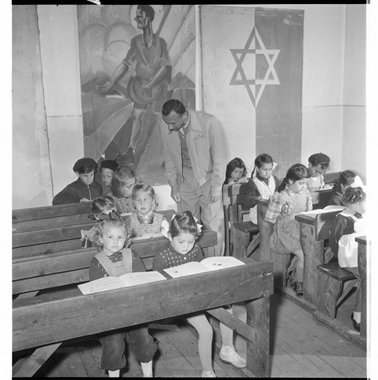 Title Jewish refugee children in English class in the Hallein DP Camp. Description Rapid progress in English is made by these Jewish children, most of whom have been living in this refugee camp since birth. The JDC started this program last January ('53) with a few interested students, there are now 12 courses in this and other DP camps in Austria, attended by 150 enthusiastic pupils. The US Information Service provided the books and the instructors were recruited form local evening schools.